The Unreasonable Man: Nudge. Nudge. Wink. Wink. Make the World a Better Place. 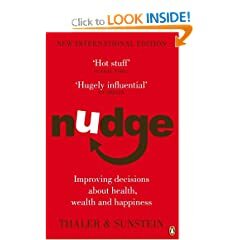 1. nudge: A book that offers advice on how to improve decisions about health, wealth and happiness. 2. thefuntheory.com: A site dedicated to the thought that something as simple as fun is the easiest way to change people’s behaviour for the better. Be it for yourself, for the environment, or for something entirely different, the only thing that matters is that it’s change for the better.